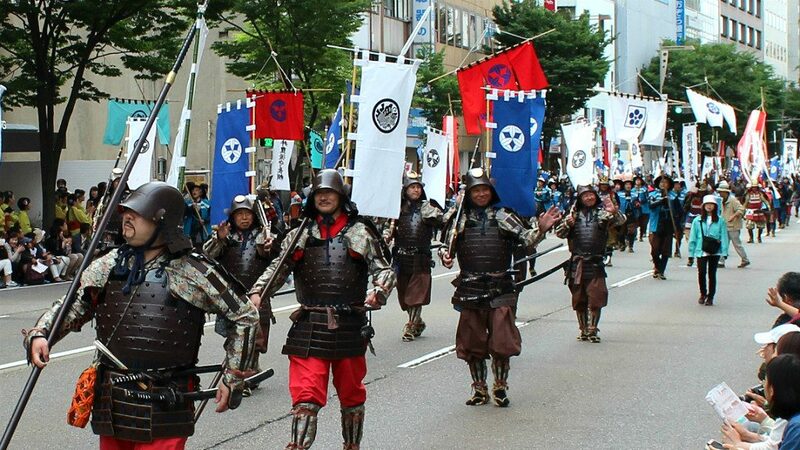 Kanazawa's 3-Day-Long Hyakumangoku Festival in June! 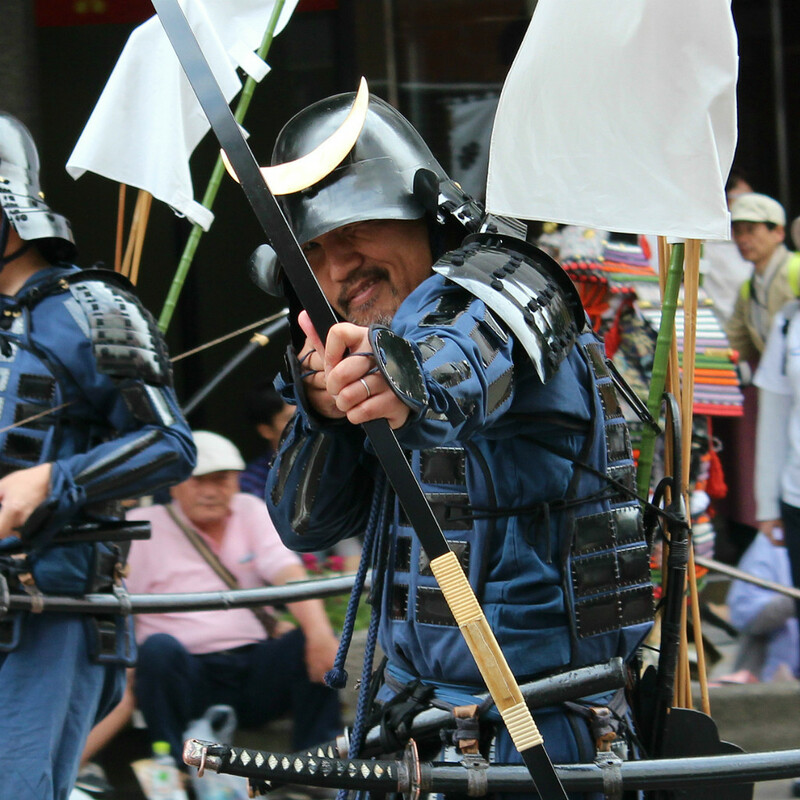 The largest Japanese festival of Kanazawa is a three-day bash at the start of June centered around the city’s rich samurai and artisan history. 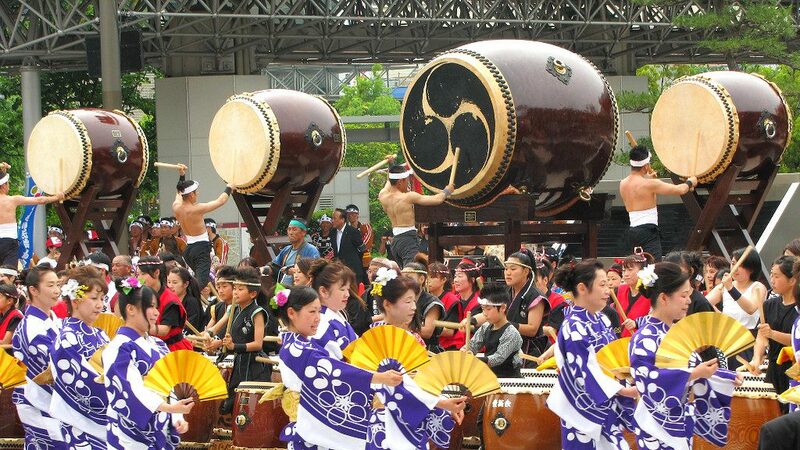 Taiko drums, marching samurai warriors, music on Japanese flutes and shamisen, lion dances, noh plays, yosakoi, tea ceremony, and over 10,000 people dancing in the streets at once! 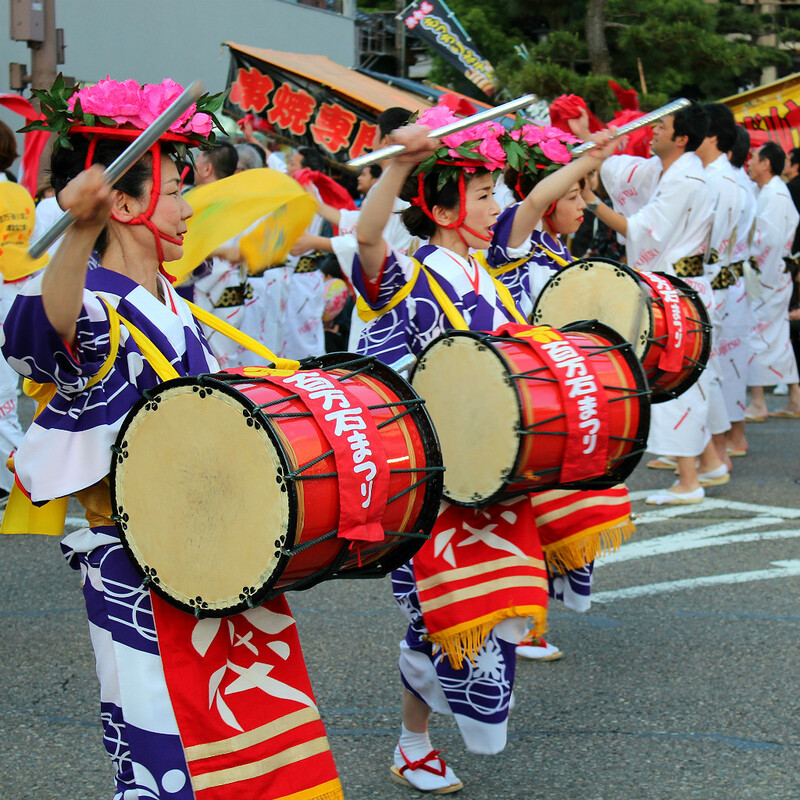 The festivities begin on a Friday evening in early summer with children parading along the streets, holding lanterns and chanting along to taiko drums. 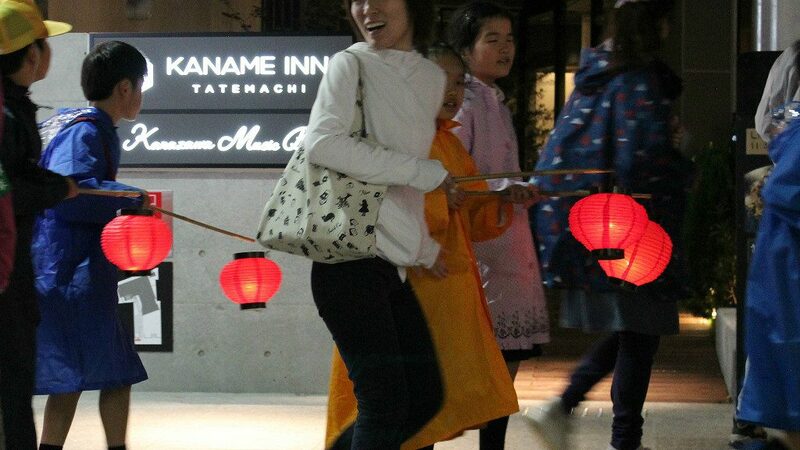 Starting from Kanazawa Central Park, they march out along many streets throughout Kanazawa, lighting the way with brilliant red orbs. 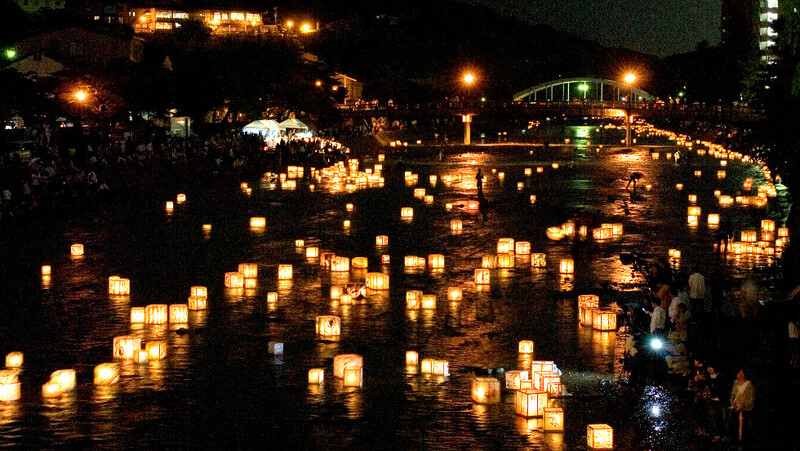 Along the Asano River, the Kaga-yuzen Tōrō Nagashi is held, and hand-painted silk-screen lanterns are released to the current, lighting the water as they float from one end of the city to the other, guiding the spirits of the departed and inviting them to join in on the weekend’s festivities. Taiko, Samurai, and Castles—Oh Noh! The grand commencement ceremony of the weekend begins Saturday afternoon in front of Kanazawa Station. 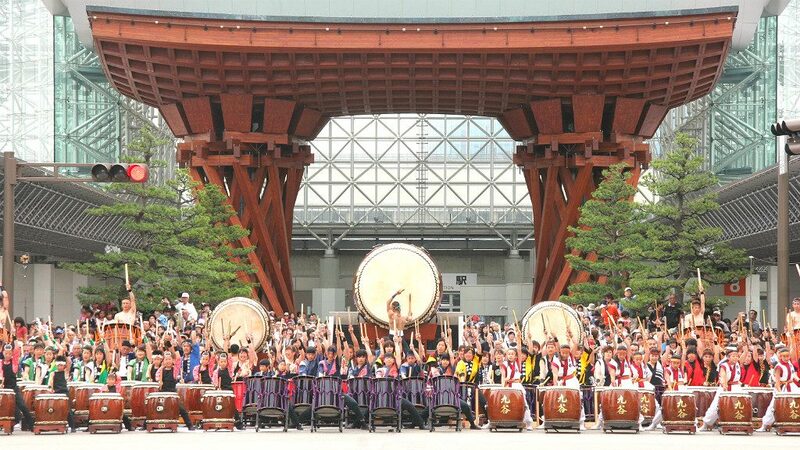 A hundred taiko drummers play in unison in front of Kanazawa Station’s “Drum Gate,” to introduce the festival’s main event, the Hyakumangoku Parade. As with many city parades in the west, the matrix includes local dance, music, and government groups, including firefighters and police. 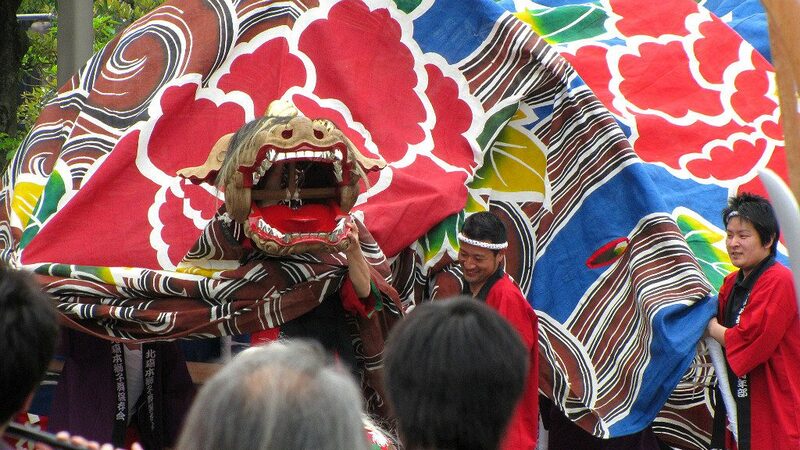 However, the scene soon transitions to more unusual fare, as the paraders pause to play ancient songs on bamboo flutes and taiko drums and put on lion dancing shows with traditionally made Kaga Lion Dance Masks, one of the areas many crafting specialties. 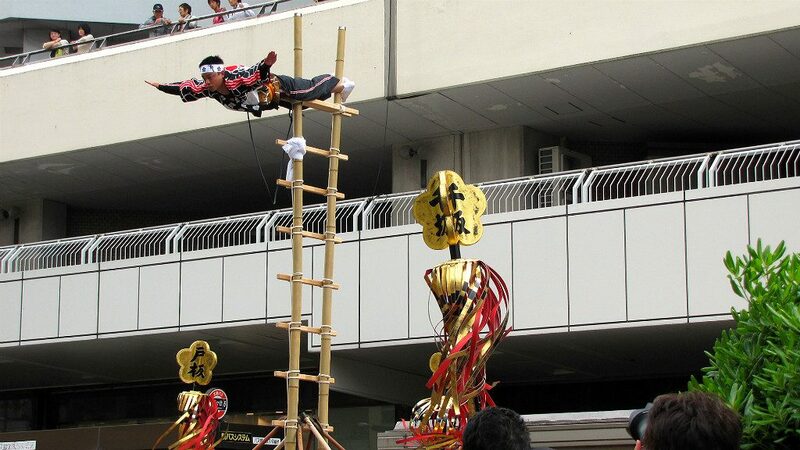 In a tradition more than three centuries old, firefighters climb bamboo ladders supported only by others’ hands. As they perform acrobatics at the ladders’ peak, massive tassels shake and twirl, and the crowds cheer. Finally, the re-enactors arrive, dressed in full samurai battle wear and armed with katanas and bows, as they make way for the star of the show, Kanazawa’s first daimyo, Toshiie Maeda, on horseback. 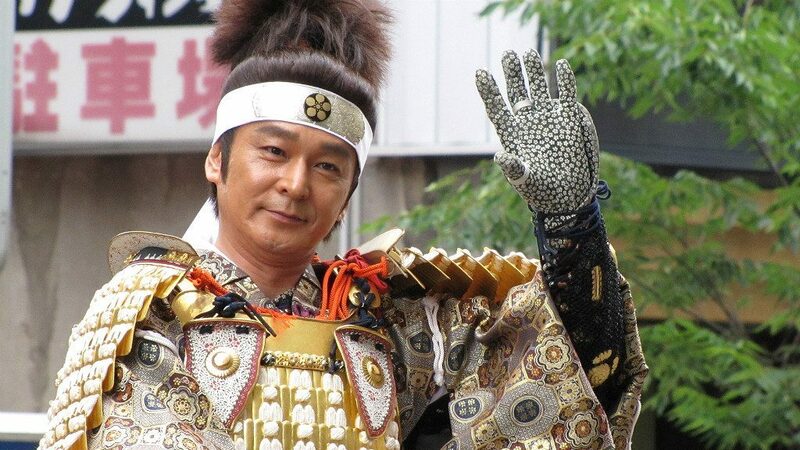 The Maeda lord and his wife are played each year by a different pair of well-known actors, and so are always crowd favorites. 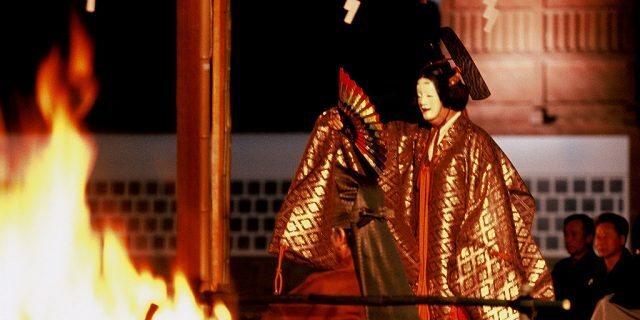 The parade culminates in front of Kanazawa Castle, where the Maedas are officially welcomed and a Noh plays are performed for the crowd on into the evening. As the parade ends, the roads are flooded with more than 12,500 dancers, volunteers and performers from the city occupy the street in a massive swirl of movement for two solid hours. 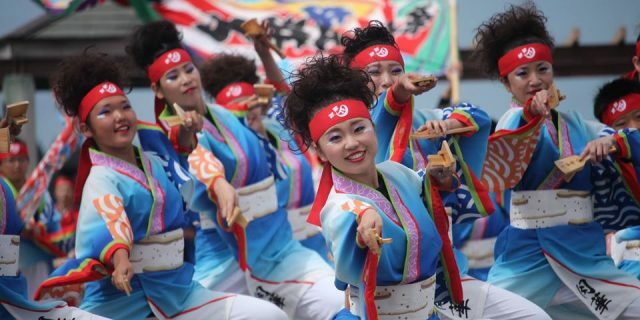 Jump in with some of the tourist-welcoming groups and follow along with the traditional dance steps of the Kaga region. If all the festivities make you hungry, you’re in luck! Throughout Saturday afternoon and evening, food booths and tents are open along the main roads and near Oyama Shrine for a tasty bite on the go. 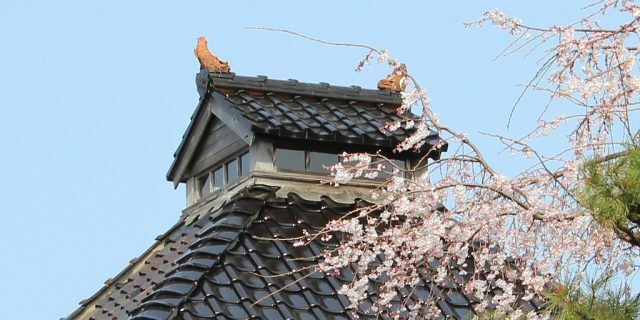 The weekend finishes off calmly in a day of rest and contemplation, as public tea ceremonies are hosted at various locations in and around Kenroku-en on Saturday and Sunday from 8:30 a.m. until 4:00 p.m. Same day tickets for tea services are first come first serve at 1500 yen a piece, but can be bought in advance at a discount of two for 2000 yen at select locations, including Nodaya on Tatemachi Street, just a few blocks away from Kaname accommodations. Times listed are approximate based on previous events’s schedules. Links to the official Hyakumangoku Festival site will change throughout the year. We will update as new information becomes available. 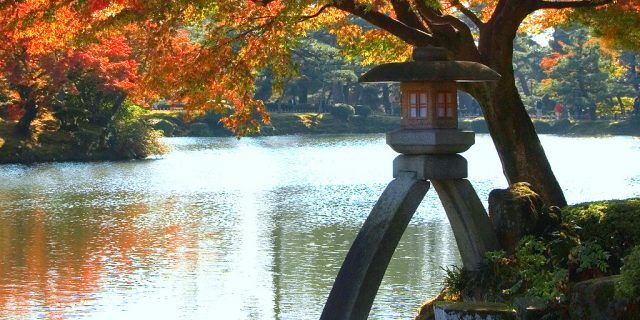 Water is ceremoniously drawn from Kanazawa’s own sacred well at Kanazawa Shrine, near the back of Kenroku-en Garden and brought to Seisonkaku Villa. Tea ceremonies performed outside. Shinto prayers begin at Oyama Shrine. Dedication ceremonies begin at Oyama Shrine. Kenshibu, “sword & fan and poetry dance,” dedication at Oyama Shrine. 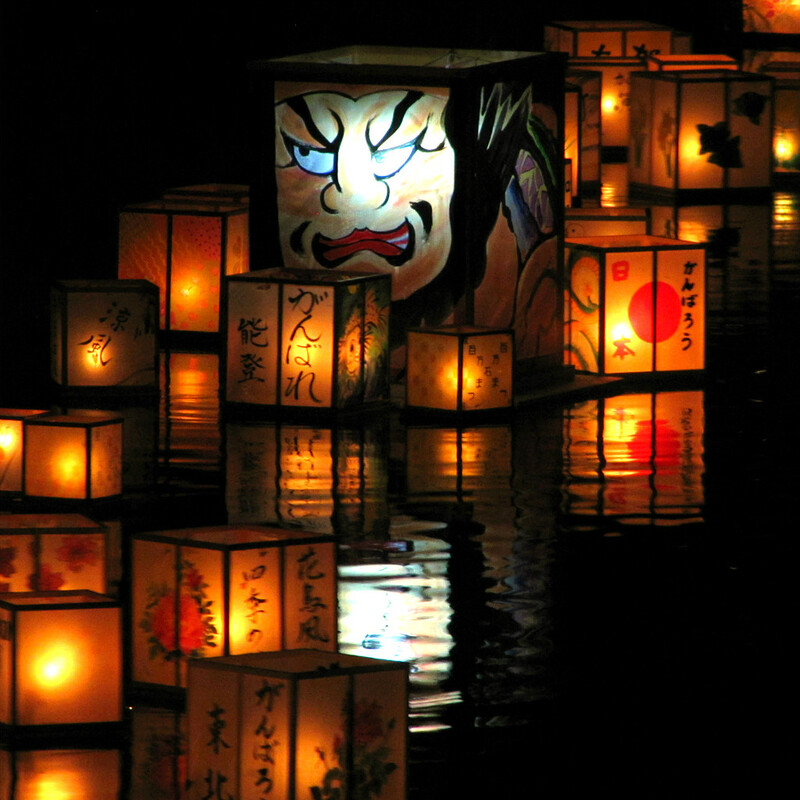 6:40 p.m. – 9:00 p.m.
Children’s parade with lanterns, festival costume, and drums, departing from the Shiinoki Culture Complex on route around the Kohrinbo and Musashi-ga-Tsuji areas. 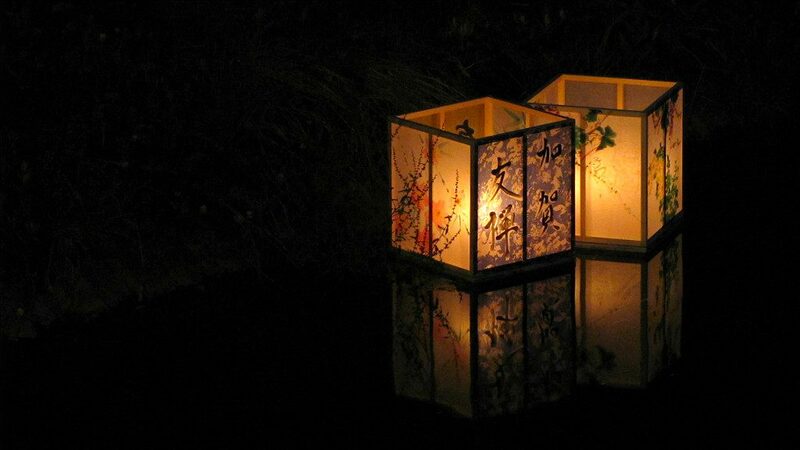 Kaga Yuzen Lanterns launched down the Asano River. 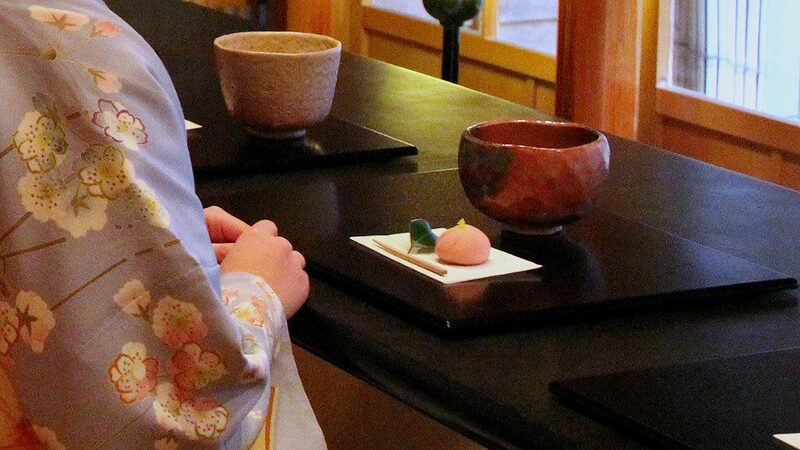 Traditional Japanese tea service is provided in and around Kenroku-en Garden. Various ceremonies at Oyama Shrine. 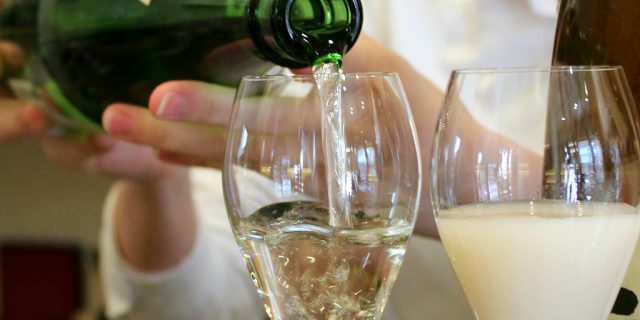 New Year’s Celebration in June! 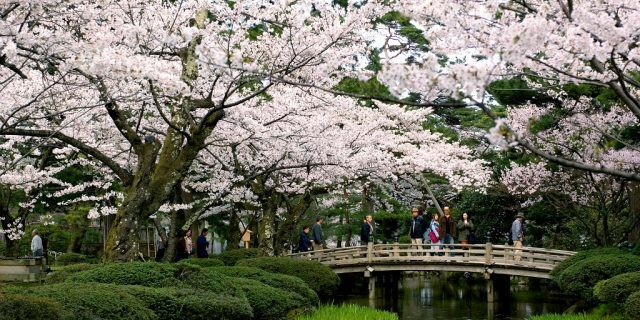 Kanazawa Castle Park becomes something of a fairground, with performances throughout the day, crafts, workshops, kimono rentals, songs, and dancing, including traditional lion dances. Food stands open up near Oyama Shrine and elsewhere along the parade route. 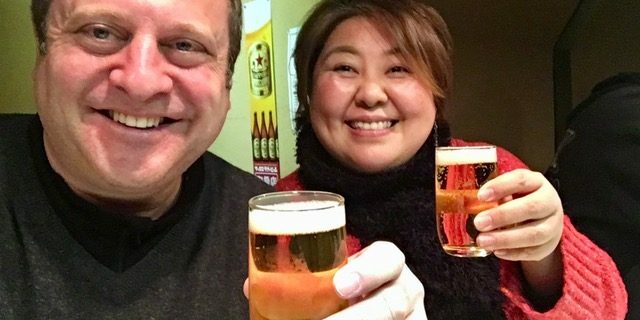 The beer garden (Asahi) at Oyama Shrine opens. Commencement Ceremony in front of Kanazawa Station. 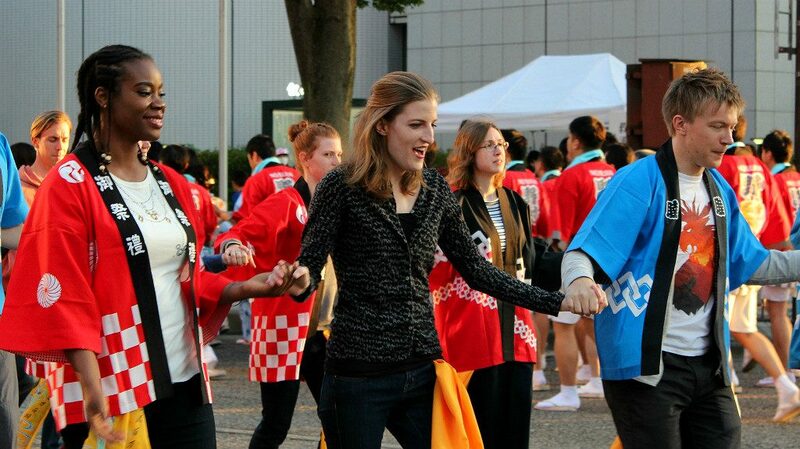 Dancing, music, and a hundred taiko drums striking in unison. 2:20 p.m. – 5:30 p.m. This is a full parade, with bands, batons, lion dances, walking shrines, acrobatics, and re-enactors in full samurai costume. The parade starts from Kanazawa Station, turns right at Musashi-ga-Tsuji (near Omicho Fish Market), left into Hirosaka, and left again to Kanazawa Castle Park. Karate demonstration at Oyama Shrine. Taiko drum performance at Oyama Shrine. Entrance Ceremony, as the figures of Toshiie Maeda and his wife Matsu are welcomed at Kanazawa Castle. 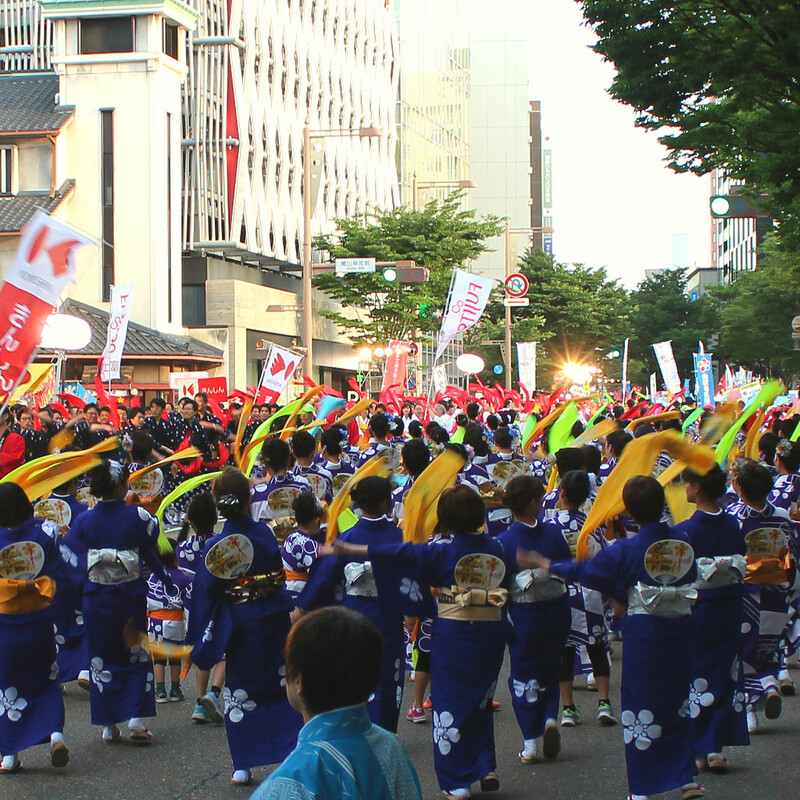 The Dancing Whirlpool of 12,500 people overtakes Kohrinbo, Katamachi, and Hirosaka in downtown Kanazawa. Children’s Noh performance at Kanazawa Castle Park. 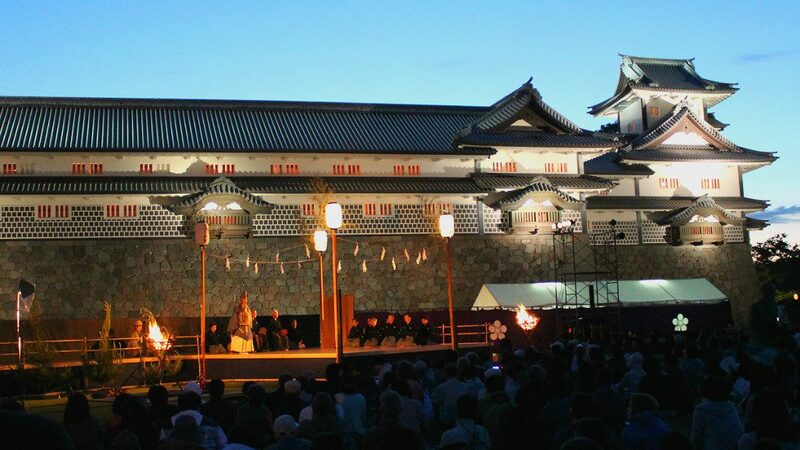 Noh and Kyogen performances at Kanazawa Castle Park, lit by firelight. 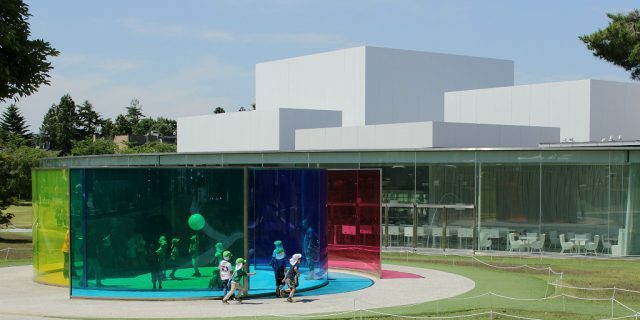 * Time may vary according to earlier events; in case of foul weather, productions will be held at the Ishikawa Prefectural Noh Theatre. Kyodo, traditional Japanese archery event behind Kanazawa Castle. New Year’s Celebration in June, day 2! 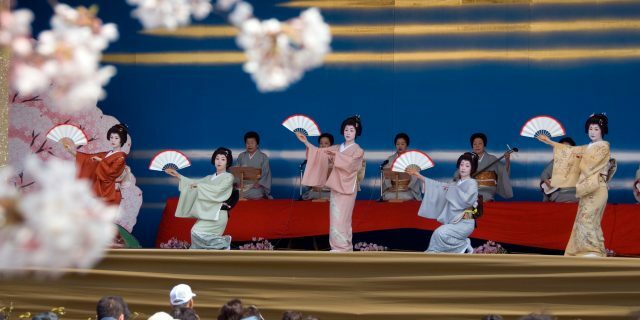 Kanazawa Castle Park becomes something of a fairground, with performances throughout the day, crafts, workshops, kimono rentals, martial arts demonstrations, songs, and dancing, including traditional lion dances. Iaido demonstration at Oyama Shrine. When the tension between swordsmen breaks, the most important move is the first one: the drawing of the sword. Traditional Meiji-era artillery demonstration on the backside of Kanazawa Castle (first showing). Traditional regional folk music and dancing performances at the Kanazawa Opera House (Kanazawa Kagekiza). Ticket information, TBA. Seats may be limited. 2:20 a.m. – 2:40 p.m. Traditional Meiji-era artillery demonstration on the backside of Kanazawa Castle (second showing). Hōchōdō demonstration at Oyama Shrine: In this centuries-old Shinto practice, a master practitioner will use only a large knife and metal chopsticks to finely cut an offering of fish for the gods, untouched by human hands.